Baltic bronze necklace from the village of Aizkraukle, Latvia dating to 12th century AD now in the British Museum. In the early medieval period, the region's peoples resisted Christianisation and became subject to attack in the Northern Crusades. Latvia's capital city Riga, founded in 1201 by Germans at the mouth of the Daugava, became a strategic base in a papally-sanctioned conquest of the area by the Livonian Brothers of the Sword. It was to be the first major city of the southern Baltic and, after 1282, a principal trading centre in the Hanseatic League. By the 16th century, Baltic German dominance in Terra Mariana was increasingly challenged by other powers. Due to Latvia's strategic location and prosperous trading city of Riga, its territories were a frequent focal point for conflict and conquest between at least four major powers: the State of the Teutonic Order, the Polish–Lithuanian Commonwealth, Sweden and Russian Empire. 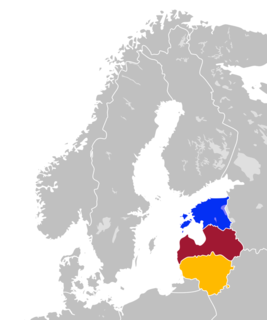 The last period of external hegemony began in 1710, when control over Riga and parts of modern-day Latvia switched from Sweden to Russia during the Great Northern War. Under Russian control, Latvia was in the vanguard of industrialisation and the abolition of serfdom, so that by the end of the 19th century, it had become one of the most developed parts of the Russian Empire. The increasing social problems and rising discontent that this brought meant that Riga also played a leading role in the 1905 Russian Revolution. The First Latvian National Awakening began in the 1850s and continued to bear fruit after World War I when, after two years of struggle in the Latvian War of Independence, Latvia finally won sovereign independence, as recognised by Soviet Russia in 1920 and by the international community in 1921. The Constitution of Latvia was adopted in 1922. Political instability and effects of the Great Depression led to the May 15, 1934 coup d'état by Prime Minister Kārlis Ulmanis. Latvia's independence was interrupted in June–July 1940, when the country was occupied and incorporated into the Soviet Union. In 1941 it was invaded and occupied by Nazi Germany, then reconquered by the Soviets in 1944–45. From the mid-1940s Latvian Soviet Socialist Republic was subject to Soviet economic control and saw considerable Russification of its peoples. However, Latvian culture and infrastructures survived and, during the period of Soviet liberalisation under Mikhail Gorbachev, Latvia once again took a path towards independence, eventually succeeding in August 1991 to be recognised by Russia the following month. Since then, under restored independence, Latvia has become a member of the United Nations, entered NATO and joined the European Union. Latvia's economy suffered greatly during the Great Recession which caused the 2008 Latvian financial crisis. Worsening economic conditions and better job opportunities in Western Europe have caused a massive Latvian emigration. The Ice Age in the territory of present day Latvia ended 14,000–12,000 years ago. The first human settlers arrived here during the Paleolithic Age 11,000–12,000 years ago. They were hunters, who following the reindeer herds camped along the rivers and shore of the Baltic Ice Lake. As geology of the Baltic Sea indicates, the coastline then reached further inland. The earliest tools found near Salaspils date to the late Paleolithic age, circa 12,000 years ago, and belong to the Swiderian culture. During the Mesolithic Age (9000 – 5400 BC) permanent settlements of hunter-gatherers were established. They hunted and fished, establishing camps near rivers and lakes; 25 settlements have been found near Lake Lubāns. These people from the Kunda culture made weapons and tools from flint, antler, bone and wood. The early Neolithic (5400 – 4100 BC) was marked by beginnings of pottery-making, animal husbandry and agriculture. During the Middle Neolithic (4100 – 2900 BC) the local Narva culture developed in the region. Inhabitants of this age were Finno-Ugric peoples, forefathers of Livonians who are closely related to Estonians and Finns and belonged to Pit–Comb Ware culture. At the beginning of the Late Neolithic (2900 – 1800 BC), present day Latvia was settled by Baltic people belonging to the Corded Ware culture. They were forefathers of Latvians, who have inhabited most of Latvian territory since the third millennium BCE. With introduction of iron tools during the early Iron Age (500 BC – 1st cent. BC) agriculture was greatly improved and emerged as the dominant economic activity. Bronze, which was traded from foreigners because Latvia has no copper or tin, was used for making a wide variety of decorative ornaments. Starting from the Middle Iron Age (400–800 AD) the local inhabitants began to form distinct ethnic and regional identities. 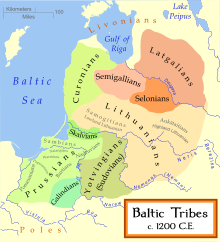 Baltic tribesmen eventually became Curonians, Semigallians, Latgalians and Selonians, while Finno-Ugric people became Livonians, Estonians and Vends; local chiefdoms emerged. At the beginning of current era, the territory known today as Latvia became famous as a trading crossroads. The renowned trade route from the Varangians to the Greeks mentioned in ancient chronicles stretched from Scandinavia through Latvian territory via Daugava to the ancient Kievan Rus' and Byzantine Empire. The ancient Balts actively participated in this trading network. Across the Europe Latvia's coast was known as a place for obtaining amber and Latvia sometimes is still called Dzintarzeme (Amberland). Up to and into the Middle Ages, amber was more valuable than gold in many places. Latvian amber was known in places as far away as Ancient Greece and the Roman Empire, and the Amber Road was intensively used for the transfer of amber to the south of Europe. During the Vendel Period near the town of Grobiņa a Scandianvian settlement was established, most likely, by people from Gotland. This colony which numbered a few hundred people existed sometime from 650 – 850 AD. Multiple chronicles mention that Curonians paid a tribute to Swedish kings. During the Late Iron Age (800–1200 AD) the three-field system was introduced, rye cultivation began, quality of local craftsmanship improved with introduction of potter's wheel and better metal working techniques. Arab, Western European and Anglo-Saxon coins dating from this era have been found. A network of wooden hill-forts was built, which provided control and security over the land. Baltic Tribes, circa 1200 CE. In the 10th century, the various ancient Baltic tribal chiefdoms started forming early realms. 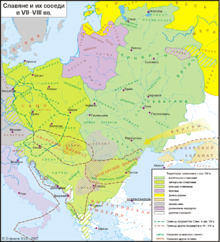 Regional tribal cultures developed in the territory of modern-day Latvia and northern Lithuania, including the Curonians, Latgalians, Selonians, Semigallians (Latvian: kurši, latgaļi, sēļi, zemgaļi) and Livonians, who united under their local chiefs. The largest tribe was the Latgalians who also were the most advanced in their socio-political development. The main Latgalian principality, Jersika, was ruled by Greek Orthodox princes from the Latgalian-Polotsk branch of the Rurik dynasty. The last ruler of Jersika, mentioned in the Chronicle of Henry of Livonia (a document that describes events of the late 12th and early 13th centuries) was King Visvaldis (Vissewalde, rex de Gercike). When he divided his realm in 1211, part of the country was called "Lettia" (terra, quae Lettia dicitur), probably the first time this name is mentioned in written sources. In contrast, the Couronians, whose territories extended into today's Lithuania and Curonian Spit, maintained a lifestyle of sea invasions that included looting and pillaging. On the west coast of the Baltic Sea they became known as the "Baltic Vikings." Selonians and Semgallians, closely related to Aukštaitians and Samogitians, were known as prosperous farmers and resisted Germans the longest under such chiefs as Viestards. Livonians lived along the shores of the Gulf of Riga and were fishers and traders, and they gave the first German name to this territory – Livland. Before the German invasions started in late 12th century, Latvia was inhabited by about 135,000 Baltic people and 20,000 Livonians. By the end of the 12th century Latvia was increasingly often visited by traders from Western Europe who set out on trading journeys along Latvia's longest river, the Daugava, to Kievan Rus'. Among them were German traders who came with Christian preachers who attempted to convert the pagan Baltic and Finno-Ugric tribes to the Christian faith. In early 1180s Saint Meinhard began his mission among Daugava Livonians. They did not willingly convert to the new beliefs and practices, they particularly opposed the ritual of baptism. News of this reached Pope Celestine III in Rome, and it was decided in 1195 that Livonian Crusade would be undertaken to convert pagans by force. Meinhard was followed by Berthold of Hanover, who was killed in 1198 near the present-day Riga by Livonians. The real founder of the German power in Latvia was Berthold's successor, Bishop Albert of Riga who spent almost 30 years conquering local rulers. Much of this period is described in the Livonian Chronicle of Henry. Bishop Albert of Riga founded Riga in 1201, and gradually it became the largest city in the southern part of the Baltic Sea. 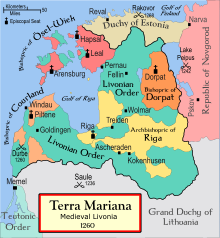 A state known as Terra Mariana, later Livonian Confederation, was established in 1207. It consisted of various territories that belonged to the Church and Order in what is now Latvia and Estonia and was under the direct authority of the Pope of Rome. In 1228 the Livonian Confederation was established. The Order of the Livonian Brothers of the Sword was founded in 1202 to subjugate the local population. The Livonians were conquered by 1207 and most of the Latgalians by 1214. When Brothers of the Sword were decimated at the Battle of Saule in 1236, they asked for incorporation into the Teutonic Order as the Livonian Order. In 1260, the Battle of Durbe destroyed Teuton hopes for a wide land bridge between their territories in Prussia and Courland. By the end of the 13th century, the Curonians and Semigallians were subjugated (in 1290 the majority of Semigallians left German-conquered areas and moved to Lithuania), and the development of the separate tribal realms of the ancient Latvians came to an end as Germans introduced direct rule over subjected peoples. In 1282, Riga (and later Cēsis, Limbaži, Koknese and Valmiera) were included in the Northern German Trading Organisation, better known as the Hanseatic League (Hansa). From this time, Riga became an important point in west-east trading, and it formed closer cultural contacts with Western Europe. Between 1297 and 1330 the Livonian Civil War raged, which started as a conflict between the Bishop of Riga and the Livonian Order. Native people initially retained much of their personal freedoms as the number of Germans was too small to implement a total control beyond the requirements to follow Christian rites, pay the required taxes and participate as soldier in wars. In case of Curonian Kings the former tribal nobility retained a privileged status until the proclamation of independent Latvia. During the 14th century peasants had to pay 10% to the Church and work 4 days of socage per year. In the 15th–16th centuries, the hereditary landed class of Baltic nobility gradually evolved from the German vassals of the Order and bishops. In time, their descendants came to own vast estates over which they exercised absolute rights. At the end of the Middle Ages this Baltic German minority had established themselves as the governing elite, partly as an urban trading population in the cities, and partly as rural landowners, via a vast manorial network of estates in Latvia. The titled landowners wielded economic and political power; they had a duty to care for the peasants dependent on them, however in practice the latter were forced into serfdom. By 16th century sockage had increased to 4 – 6 days per week and various taxes to 25%. Peasants increasingly tried to escape to freedom, either by moving to Riga (they could gain freedom if they lived there for one year and one day) or another manor. In 1494 a law was passed which forbade peasants to leave their land, virtually enslaving them. The Reformation reached Livonia in 1521 with Luther's follower Andreas Knöpken. During the Protestant riot of 1524 Catholic churches were attacked and in 1525 freedom of religion was allowed. First Latvian parishes were established and services held in Latvian. Protestants gained support in the cities, and by the middle of the 16th century the majority of the population had converted to Lutheranism. Livonian Confederation ceased to exist during the long Livonian War of 1558–82. The Livonian Order was dissolved by the Treaty of Vilnius in 1561. The following year, the Livonian Landtag decided to ask protection from King Sigismund II of Poland and Grand Duchy of Lithuania. With the end of government by the last Archbishop of Riga, William of Brandenburg, Riga became a Free Imperial City  and the rest of the territory was divided into Polish-Lithuanian vassal states - Duchy of Courland and Semigallia (Polish vassal) and the Duchy of Livonia (Lithuanian vassal). Livonian war put an end to the Livonian Confederacy. Despite the very real threat of Muscovite rule over the whole Livonia, Western Christian countries managed to establish their control over this area for the next 150 – 200 years. In September 1557 the Livonian Confederation and the Polish–Lithuanian union signed the Treaty of Pozvol, which created a mutual defensive and offensive alliance. Tsar Ivan the Terrible of Muscovy regarded this as a provocation, and in January 1558 he reacted with the invasion of Livonia that began the Livonian War of 1558–83. On August 2, 1560 the forces of Ivan the Terrible destroyed the last few hundred soldiers of the Livonian Order and the Archibishop of Riga at the Battle of Ērģeme. In 1561 the weakened Livonian Order was dissolved by the Treaty of Vilnius. Very much following the earlier model of Prussian Homage its lands were secularised as the Duchy of Livonia (Lithuanian vassal) and the Duchy of Courland and Semigallia (Polish vassal) were created. The last Master of the Order Gotthard Kettler became the first Duke of Courland and converted to Lutheranism. In 1560 Johannes IV von Münchhausen, the prince-bishop of Ösel-Wiek and Courland, sold his lands to king Frederick II of Denmark for 30,000 thalers. To avoid partition of his lands, King Frederick II gave these territories to his younger brother Magnus, Duke of Holstein on condition that he renounce his rights to succession in the duchies of Schleswig and Holstein. Magnus was recognised as sovereign by the Bishop of Ösel-Wiek and Courland and as the prospective ruler of his lands by the authorities of The Bishopric of Dorpat. The Bishopric of Reval with the Harrien-Wierland gentry took his side. Gotthard Kettler, the last Master of the Livonian Order, gave Magnus the portions of Livonia he had taken possession of, along with Archbishop Wilhelm von Brandenburg of the Archbishopric of Riga and his coadjutor Christoph von Mecklenburg. On June 10, 1570 Duke Magnus of Holstein arrived in Moscow, where he was crowned King of Livonia. Magnus took an oath of allegiance to Ivan the Terrible as his overlord and received from him the corresponding charter for the vassal kingdom of Livonia in what Ivan termed his patrimony. The armies of Ivan the Terrible were initially successful, taking Polotsk in 1563 and Pärnu in 1575 and overrunning much of Grand Duchy of Lithuania up to Vilnius. In the next phase of the conflict, in 1577 Ivan IV took opportunity of the Polish-Lithuanian Commonwealth's internal strife (called the war against Gdańsk in Polish historiography), and during the reign of Stefan Batory invaded Livonia, quickly taking almost the entire territory, with the exception of Riga and Revel. In 1578 Magnus of Livonia recognized the sovereignty of Polish–Lithuanian Commonwealth (not ratified by the Sejm of Poland-Lithuania, or recognized by Denmark). In 1578 Magnus retired to The Bishopric of Courland where he lived in Piltene Castle and accepted Polish pension. After he died in 1583, Poland annexed his territories to the Duchy of Courland and Semigallia and Frederick II decided to sell his rights of inheritance. Except for the island of Œsel, Denmark was out of the Baltic by 1585. Jan Hieronimowicz Chodkiewicz became the first Governor of the Duchy (1566–1578) with the seat in Sigulda Castle. 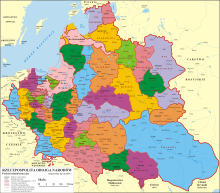 It was a province of Grand Duchy of Lithuania until 1569. After the Union of Lublin in 1569, it became a joint domain of the Polish Crown and the Grand Duchy. Muscovy recognized Polish–Lithuanian control of Ducatus Ultradunensis in 1582. The larger part of the Duchy was conquered by Swedish Kingdom during the Polish–Swedish War (1626–29), and was recognized as Swedish territory in the Truce of Altmark. The Commonwealth retained southeastern parts of the Wenden Voivodeship, renamed to Inflanty Voivodeship with the capital in Daugavpils (Dyneburg). Catholicism became the dominant religion in this territory, known as Inflanty or Latgale, as a result of Counter-Reformation. During the first Partition of Poland in 1772, when it was annexed by Catherine the Great's Russian Empire and title "Grand Duke of Livonia" was added to the grand title of Russian Emperors. During the Polish–Swedish War (1600–1629) Riga and the largest part of Duchy of Livonia came under Swedish rule in 1621. During the Swedish rule this region was known as the "Swedish Bread Basket" because it supplied the larger part of the Swedish Kingdom with wheat. Riga was the second largest city in the Swedish Empire at the time. Together with other Baltic Sea dominions, Livonia served to secure the Swedish Dominium maris baltici. In contrast to Swedish Estonia, which had submitted to Swedish rule voluntarily in 1561 and where traditional local laws remained largely untouched, the uniformity policy was applied in Swedish Livonia under Karl XI of Sweden: serfdom was abolished in the estates owned by the Swedish crown, peasants were offered education and military, administrative or ecclesiastical careers, and nobles had to transfer domains to the king in the Great Reduction. These reforms were subsequently reversed by Peter I of Russia when he conquered Livonia. In 1632 the Swedish king Gustavus Adolphus founded Dorpat University which became the intellectual focus for population of Livonia. The translation of the whole Bible into Latvian in 1685 by Johann Ernst Glück was subsidized by the Swedish government. Schools for Latvian speaking peasantry were set up in the country parishes. In Latvian history this period is generally praised as the "good Swedish times". After Gotthard Kettler became the first duke, other members of the Order became the nobility, with their fiefdoms becoming their estates. Kettler received nearly one-third of the land in the new duchy. Mitau (Jelgava) was designated as the capital and a Landtag was to meet there twice a year. When Gotthard Kettler died in 1587, his sons Friedrich and Wilhelm became the dukes of Courland. They divided the Duchy into two parts in 1596. Friedrich controlled the eastern part, Semigalia (Zemgale), with his residence in Mitau (Jelgava). Wilhelm owned the western part, Courland (Kurzeme), with his residence in Goldingen (Kuldīga). Wilhelm regained the Grobiņa district when he married the daughter of the Duke of Prussia. Here he developed metalworking, shipyards, and the new ships delivered the goods of Courland to other countries. Wilhelm's conflict with local nobles ended with his removal from the duke's seat in 1616 and Friedrich became the only duke of Courland after 1616. Under the next duke, Jacob Kettler, the Duchy reached the peak of its prosperity. During his travels in Western Europe, Jacob became the eager proponent of mercantilist ideas. Metalworking and ship building became much more developed, and powder mills began producing gunpowder. Trading relations developed not only with nearby countries, but also with Britain, France, the Netherlands and Portugal. Jacob established the merchant fleet of the Duchy of Courland, with its main harbours in Windau and Libau. In Windau 120 ships were built, of which over 40 were warships. The duchy owned large fleet and established two colonies — St. Andrews Island in the estuary of Gambia River (in Africa) and Tobago Island (in the Caribbean Sea). Courland related place names from this period still survive today in these places. The last duke, Peter von Biron who ruled under heavy Russian influence founded Academia Petrina in 1775. In April 1786 he purchased the Duchy of Sagan from the Bohemian Lobkovic family, from then additionally using the title of Duke of Żagań. In 1795, Russia determined the further fate of Courland when with its allies it began the third division of Poland. Given a "nice recommendation" by Russia, Duke gave up his rights in return of large payment, signing of the final document on March 28, 1795. Enlightenment ideas influenced local Baltic Germans, two of whom played great role in the creation of Latvian nation. Gotthard Friedrich Stender wrote the first Latvian-German and German-Latvian dictionaries. He also wrote the first encyclopedia “The book of high wisdom of the world and nature” (1774) and the first illustrated Latvian alphabet book (1787). Garlieb Merkel in 1796 published his book “The Latvians” in which exposed the horrible conditions of serfdom under which Latvians were forced to live because of cruelty of their German masters. In 1700 the Great Northern War between Sweden and Russia started largely because Peter the Great wanted to secure and enlarge Russian access to the Baltic ports. In 1710 Russians conquered Riga and Estonia and Livonia capitulated. Losses from the military actions were multiplied by the Great Northern War plague outbreak which killed up to 75% of people in some areas. In 1713 Peter established the Riga Governorate, and after various administrative and territorial reforms, Governorate of Livonia was finally established in 1796. Latvians call it Vidzeme Governorate (Vidzemes guberņa). Sweden officially gave up its claims to Swedish Livonia with the 1721 Treaty of Nystad. The Treaty enshrined the existing privileges and freedoms of the German Baltic nobility. They were allowed to maintain their financial system, existing customs border, self-governing provincial Landtags and city councils, Lutheran religion and German language. This special position in the Russian Empire was reconfirmed by all Russian Emperors from Peter the Great (reigned 1682–1725) to Alexander II  (reigned 1855-1881). Only the 1889 judicial reform imposed Russian laws and a program of Russification enforced school education in Russian. After the First Partition of Poland in 1772 Russia gained Inflanty Voivodeship which was first included in the Mogilev Governorate and after 1802 in Vitebsk Governorate. This led to increased cultural and linguistic separation of Latgalians from the rest of ethnic Latvians. A large Daugavpils fortress was built here. After the Third Partition of Poland and financial settlement with the last Duke of Courland and Semigallia in 1795 the Courland Governorate was created in which the Germans retained their privileges and autonomy for another century. Russian empire now possessed all the territories inhabited by Latvians. In 1812 Napoleon's troops invaded Russia and the Prussian units under the leadership of the field marshal Yorck occupied Courland and approached Riga and the Battle of Mesoten was fought. Napoleon proclaimed restoration of Duchy of Courland and Semigallia under French and Polish protectorate. The Russian governor-general of Riga Ivan Essen was expecting attack, and set the wooden houses of Riga suburbs on fire to deflect the invaders leaving thousands of city residents homeless. However, York did not attack Riga and in December the Napoleon's army retreated. After the October 1802 Kauguri rebellion, czarist authorities reacted with the law of February 20, 1804 which was aimed at improving peasant condition in Livonian Governorate. Peasants no longer were tied to the land-owner, but to the land, so they could be sold only together with the land. Peasants were divided in two classes – people of manors and plowmen. Plowmen were divided into farm-owners and free people. Farms from now on could be inherited within the family. Amount and length of socage now was regulated and limited. This law was opposed by the nobles, who in 1809 secured changes in the law which again gave them more power over peasants and socage. In 1816 Governorate of Estonia proposed a law for emancipation of serfs which was based on the model of the Prussian reforms. Czarist authorities ordered Courland Landtag to come up with a similar proposal, which was accepted on August 25, 1817 and proclaimed in Jelgava on August 30, 1818 in presence of Czar Alexander I. Emancipation came into force in 1819 and continued until 1832 as only selected number of peasants was emancipated each year. Emancipation gave peasants personal freedom, but no land, which they had to lease from land-owners. Peasants were not completely free, as they still could not move to another governorate or city without land-lord's permit. After Emancipation in Estonia and Courland, the situation in Livonia was resolved by the law of March 26, 1819, which was very similar to the Emancipation law of Courland. It was proclaimed on early 1820 and was in force until 1832. As Latgale was part of the Russian Vitebsk Governorate, serfdom here lasted until 1861, when the Emancipation reform of 1861 was proclaimed in the Russian Empire. Initially peasants kept their land, but had to continue performing socage and rent payments. This was ended by the new law of March 1, 1863. After 1832 peasants were allowed freedom of settlement within the governorate, but only in 1848 Courland peasants were allowed to settle in towns and cities, many of which until then had mostly German and Jewish populations. The provisional Livonian agrarian law of July 9, 1849 which came int force on November 20, 1850 maintained German nobility's property rights, but allowed peasants to rent or buy the land. By 1856 only 23% of farmers were paying land rent, while the rest were still performing socage. In 1860 this law became permanent and allowed increasing number of farmers to purchase their homes. An 1864 law permitted creation of credit unions, and this improved access to capital for farmers wanting to buy their homes from German land-lords. Just before the start of World War I about 99% of houses in Courland were bought and 90% in Livonia. This created a land-owning Latvian farmer class which increased in prosperity and sent its sons to schools of higher education. In 1870-80's many peasants who were unable or unwilling to purchase their land, used the opportunity to emigrate to Siberia, where land was given for free. By the start of World War I approximately 200,000 Latvian farmers had moved to farming colonies in Siberia. While there are records of Latvian last names going as far back as 15th century, almost all of them were inhabitants of large cities and often adopted Germanic family names. Some peasants had family names in the 17th century, but majority had only first name until the emancipation. Most people were identified by the name of their house or manor. Emancipation created the need for identity papers and with this, for family names. Livonian peasants had to choose family names by 1826, in Courland majority names were selected in the campaign that lasted from October 1834 until July 1835. Peasants were prohibited from choosing family names of German nobility and majority chose names related to animals, plants and trees, especially popular were diminutive forms – Bērzs (birch), Bērziņš (small birch), Kalns (hill), Kalniņš (small hill). Latvia was predominantly Lutheran and Catholic, but in 1729 Herrnhuter Brethren started their mission in Livonia, with center in Valmiera, their missionaries made significant headway despite the opposition of the German landlords who controlled the Lutheran clergy. The Imperial government proscribed the Moravians 1743–1764. This was the first Christian movement where Latvians become involved voluntarily. Brethren operated independently from the hated Germans and their meeting houses were run by Latvians, giving them a chance to create their own communities. Brethren reached the peak of their popularity around 1820, a few years after serfdom was abolished in Livonia Governorate. 30 parishes had almost 100 meeting houses and 20,000 members. The Imperial government sponsored the Russian Orthodox Church, as part of its program of russification, but Lutheranism remained the dominant religion, except Latgale where Catholicism was dominant. Other Protestant missions had some success including the Baptists, Methodists and Seventh Day Adventists. In 1571 the first Jews were invited to settle in Piltene and a Courland Jewish community was formed. After incorporation into Russian Empire more Jews from the former Polish-Lithuanian Commonwealth settled here. Latvian national awakening could start after the emancipation of serfs and growth in literacy and education rates. Educated Latvians no longer wanted to be Germanized. In 1822 Latviešu avīzes the first weekly in Latvian began publishing. In 1832 weekly Tas Latviešu Ļaužu Draugs began publishing. The first Latvian writers who wrote in Latvian appeared – Ansis Liventāls (1803–77), Jānis Ruģēns (1817–76) and others. In 1839 institute for the elementary school teachers led by Jānis Cimze opened in Valmiera. By the middle of 19th century, the First Latvian National Awakening began among ethnic Latvian intellectuals, a movement that partly reflected similar nationalist trends elsewhere in Europe. This revival was led by the "Young Latvians" (in Latvian: jaunlatvieši) from the 1850s to the 1880s. Primarily a literary and cultural movement with significant political implications, the Young Latvians soon came into severe conflict with the Baltic Germans. During this time the notion of a united Latvian nation was born. Young Latvians also began to research Latvian folklore (See:Latvian dainas) and ancient beliefs. In the 1880s and 1890s the russification policy was begun by Alexander III aimed at reducing German autonomy in the Baltic provinces. Introduction of the Russian language in administration, court and education was meant to reduce predominance of German language. At the same time these policies banned Latvian language from public sphere, especially schools, which was a heavy blow to the new Latvian culture. With increasing poverty in many rural areas and growing urbanization and industrialization (especially of Riga), a loose but broad leftist movement called the "New Current" arose in the late 1880s. It was led by the future National poet Rainis and his brother-in-law Pēteris Stučka, editors of the newspaper Dienas Lapa. This movement was soon influenced by Marxism and led to the creation of the Latvian Social Democratic Labour Party. While Rainis remained a social democrat until his death, Stučka become allied with Lenin, established the first Bolshevik state in Latvia and died in Moscow. Latvia welcomed the 20th century with an explosion of popular discontent during the 1905 Revolution. It started with the shooting of demonstrators in Riga on January 13, progressed to mass strikes in October and armed uprising in December. The revolution was aimed not only against the czarist authorities, but against the hated German barons. For in Latvia most did not feel primarily oppressed by Russia or Russians, but by the Baltic Germans —roughly seven percent of the population— who had instituted a feudal system with themselves at the top and Latvian-speakers being left mostly poor and landless. As such, it involved not only left wing social democrats and industrial workers, but also more conservative peasants and Latvian intelligentsia since —despite being second class citizens in their own country— Latvia was also a highly literate and industrialised society. Riga was behind only St. Petersburg and Moscow by the number of industrial workers, and at the turn of the century over 90% of Latvians could read. In this regard, Latvia was equally primed for radical leftism and nationalism. In all, spearheaded by the Latvian Social Democratic Workers’ Party (LSDSP), the governorates making up what is now Latvia were probably the most ungovernable in the whole Russian Empire. Following the shooting of demonstrators in St. Petersburg on January 9, 1905 a wide-scale general strike began in Riga. On January 13 Russian army troops opened fire on demonstrators in Riga killing 73 and injuring 200 people. During the summer of 1905 the main revolutionary events moved to the countryside. 470 new parish administrative bodies were elected in 94% of the parishes in Latvia. The Congress of Parish Representatives was held in Riga in November. Mass meetings and demonstrations took place including violent attacks against Baltic German nobles, burning estate buildings and seizure of estate property, including weapons. In total 449 German manor houses were burned. In the autumn of 1905 armed conflict between the German nobility and the Latvian peasants began in the rural areas of Vidzeme and Courland. In Courland, the peasants seized or surrounded several towns where they established revolutionary councils. In Vidzeme the fighters controlled the Rūjiena-Pärnu railway line. Altogether, a thousand armed clashes were registered in Latvia in 1905. Martial law was declared in Courland in August 1905 and in Vidzeme in late November. Special punitive expeditions by Cossack cavalry units and Baltic Germans were dispatched in mid-December to suppress the movement. They executed over 2000 people without trial or investigation and burned 300 houses and public buildings. The executed often were local teachers or peasant activists who had shown disrespect to German nobles, not necessarily hardened revolutionaries. 427 people were court martialed and executed. 2652 people were exiled to Siberia, over 5000 went into exile to Western Europe or the US. In 1906 the revolutionary movement gradually subsided but some local protests and actions of forest guerrillas continued until 1907. They executed some daring raids – freeing their imprisoned comrades from Riga police HQ on January 17, 1906, February 26, 1906 Helsinki bank robbery and the 1910 Siege of Sidney Street in London. Among the exiles were activists from the left and right who in just 10 years would fight against each other over the future of Latvia, such as the future Prime Minister Kārlis Ulmanis, National poet Jānis Rainis and early Cheka leader Jēkabs Peterss. Hard times for the fatherland, sons, sons, help! A patriotic postcard, 1916. On August 1, 1914 Germany declared war on Russia. Since Courland Governorate had a direct border with Germany it was immediately involved in warfare. On August 2 German warships SMS Augsburg and SMS Magdeburg shelled port city Liepāja, causing it light damage. On August 19 German navy tried to capture Užava Lighthouse but were repelled, after which German artillery destroyed it. In October British submarines HMS E1 and HMS E9 from the British submarine flotilla in the Baltic arrived in Liepāja. On November 17 German navy again shelled Liepāja and military installations of Karosta damaging some 100 buildings. Many Latvians served in the Russian units stationed at German border and took part in Russian invasion of East Prussia. They participated in the early battles of First Battle of the Masurian Lakes, Second Battle of the Masurian Lakes and Battle of Augustow; total Latvian losses during these battles might have reached 25,000 dead. By May 1915 the war reached most of Latvia. On April 30 Russian Commander-in-Chief ordered evacuation of all Jews from Courland within 24. hours. On May 2, 1915 German attack against Jelgava was repelled. On May 7 the Germans captured Liepāja and Kuldīga. On June 29 the Russian Supreme Command ordered the whole population of Courland evacuated, and around 500,000 refugees fled to the east. Much of the crops and housing was destroyed by the army to prevent it from falling in the German hands. Some of refugees settled in Vidzeme but most continued their way to Russia where they had to settle in primitive conditions, suffering from the hunger and diseases. In August 1915 the Latvian Refugee Aid Central Committee was established in Petrograd, it was run by future politicians Vilis Olavs, Jānis Čakste and Arveds Bergs. Committee organized refugee housing, organized 54 schools, 25 hospitals and distributed aid. Many refugees returned to Latvia only after 1920, when a peace treaty was signed between Latvia and Soviet Russia. Many Latvians stayed in the new Bolshevik state, achieving high army and party offices, only to be purged and executed by Stalin during 1937–38. On July 19, 1915 the Russian War Minister ordered the factories of Riga evacuated together with their workers. In the summer of 1915, 30,000 railway wagons loaded with machines and equipment from factories were taken away reducing the population of Riga by some 50%. This action effectively destroyed Riga as a great industrial center until the later industrialization under the Soviet regime. On August 1, Germans captured the capital of Courland, Jelgava. A week later Battle of the Gulf of Riga started and eventually was lost by Germany. By October 23, Germans captured Ilūkste and were within the striking distance of Daugavpils with its fortress. After on July 17 and 18, 1915 Germans captured Dobele, Talsi, Tukums and Ventspils, a public proclamation by State Duma members, written by Kārlis Skalbe, called for the formation of volunteer Latvian Riflemen units. In August the formation of Latvian battalions started. From 1915 to 1917, the Riflemen fought in the Russian army against the Germans in defensive positions along the Daugava River, notably the Nāves sala (Island of Death) bridgehead position. In December 1916 and January 1917, they suffered heavy casualties in month-long Christmas Battles. Many of them were buried in the newly created Riga Brothers' Cemetery. After the great offensive of 1915, the front line stabilized along the Daugava river until the Russian army started to collapse in early 1917. In February 1917 Revolution broke out in Russia and in the summer the Russian army collapsed. By this time the Riflemen had overwhelmingly transferred their allegiances to the Bolsheviks. The following German offensive was successful and on September 3, 1917 they entered Riga. In November 1917, the Communist Bolsheviks took power in Russia. Even though ethnic Latvians had become important assets in the task of securing Soviet power military (with the first ever commander-in-chief of the Red Army being Latvian Jukums Vācietis) the Bolshevik government tried to end the war and in March 1918, the Treaty of Brest-Litovsk was signed which gave Courland and Livonian Governorate to the Germans, who quickly established occupational regime which lasted until November 11, 1918. During this time Germans tried to create the United Baltic Duchy in perpetual union with the Crown of Prussia. A survey in 1920 established that 56,7% of parishes had war damages. Population had decreased from 2,55 million to 1,59 million. The number of ethnic Latvians has never again reached the 1914 levels. 87,700 buildings were destroyed. 27% of the arable land laid in waste. Much of the industry was evacuated to Russia and lost forever. Ports were damaged by sunken ships, bridges blown up and railways damaged. 25,000 farms were destroyed, 70,000 horses, 170,000 cattle lost. Flag of the Republic of Latvia. Valka Town Hall, where December 2, 1917 Declaration of Autonomy was issued. Now Valga in Estonia. The course of World War I, which directly involved Latvians and Latvian territory, led to the idea of Latvian statehood. During the summer of 1915 German army conquered Kurzeme and Zemgale, which caused a virtual exodus of Latvians from these two provinces. Local politicians gained experience organizing refugee relief and Latvian refugee cultural life. Caught between the attacking Germans and incompetent Russians, Latvian riflemen (latviešu strēlnieki) bravely fought on the Russian side during this war and became increasingly radicalized after repeated setbacks under czarist generals. During the Russian Civil War a significant group (known as Red riflemen) fought for Bolsheviks. Meanwhile, German Empire and local Baltic Germans were planning to annex the ancient Livonian and Estonian lands to their Empire. During the chaotic period of Russian and German empire collapses, February Revolution and Bolshevik revolution, Soviet westward offensive and onset of the Russian Civil War there were various efforts to establish a state in Latvia. Not all of them were aimed at establishing an independent state or even a Latvian state. After the February Revolution in Russian Empire majority of Latvians were not expecting more than a federated status in a Russian state. "Free Latvia in Free Russia" was the slogan of the day. During March 12–13, 1917 in Valmiera the Vidzeme Land Congress was held which created the Provisional Land Council of Vidzeme. Courland was occupied by Germans, who increasingly supported idea of creating a puppet Duchy of Courland and Semigallia in order to annex it to Germany. Latgalian inhabited counties of the Vitebsk Governorate were demanding unity with other Latvian provinces (unification of Latgalian Latvians and Baltic Latvians), which came only after the Bolshevik revolution. On July 5, 1917 the Russian Provisional Government recognized the elected Land councils of Vidzeme and Kurzeme. Encouraged by the liberalism of the Provisional government, Latvians put forward proposals which envisioned a broad local autonomy. On August 12, 1917 Latvian organizations jointly asked the Provisional government for autonomy and self-determination. During this Congress from August 11–12 (July 29–30, Old Style) in Riga, the left wing Social Democrats, heavily influenced by the Bolsheviks, established Iskolat government. After Riga was occupied by Germans on September 3, 1917 Iskolat retreated to Vidzeme, where it assumed executive powers. The so-called Iskolat Republic existed from November 21, 1917 until March 3, 1918. Under German attacks it evacuated to Cēsis, then Valka and was disbanded on March 1918 after the Brest-Litovsk treaty left Latvian lands (except Latgale) to Germany. After the preliminary meeting on September 14, on September 23, 1917 in the German occupied Riga the Latvian Social Democratic party together with Latvian Farmers' Union and some smaller republican and socialist parties created the Democratic bloc which petitioned Ober Ost for the restoration of elected Riga City Council, re-opening of schools and press freedoms. Democratic Bloc was not a formal organization, but a coalition of politicians, who shared similar political goals. Latvian Social Democrats used their old contacts with the German Social Democrat Party, to directly lobby politicians in Berlin. On October 19, 1918 Democratic bloc representatives delivered a petition to the German Imperial chancellor Prince Maximilian of Baden, in which they asked for the removal of occupational forces, release of POW’s and recognition of independent Latvian state. In October 1917 centrist politicians met in Petrograd and agreed to create a united Council of all Latvian parties, refugee support organizations and soldiers committees. On November 29, 1917 the Latvian Provisional National Council was established in Valka. On December 2, 1917 it proclaimed creation of Latvia’s autonomy in Latvian inhabited lands and proclaimed itself to be the only representative organ of Latvians. Council announced three main goals – convening of a Constitutional Assembly, creation of political autonomy and uniting of all ethnic Latvian inhabited lands. The National Council, which was led by Voldemārs Zāmuēls sent a delegation, led by the future Minister of Foreign Affairs Zigfrīds Anna Meierovics to Allied countries, to get their support for independent Latvia. Provisional National Council existed in the same place and time as the Bolshevik controlled Iskolat – the small city of Valka, which is situated on the border between ethnic Estonian and ethnic Latvian lands and for a couple of months was the virtual capital of Latvians. Iskolat moved to ban the Provisional Council in December 1917. On January 5, 1918, during the only meeting of democratically elected Constituent Assembly of Russia, which was abolished by Bolsheviks, Latvian deputy Jānis Goldmanis, the initiator in 1915 of creation of Latvian Riflemen units, read a declaration of separation of Latvia from Russia. On its second meeting, which was held in Petrograd, the Latvian National Council on January 30, 1918 declared that Latvia should be an independent, democratic republic, uniting Latvian regions Kurzeme (which includes Zemgale), Vidzeme and Latgale. On March 3, 1918 Soviet Russia signed treaty of Brest-Litovsk with German Empire, by which Russia gave up Kurzeme and Vidzeme (but not Latgale). National Council protested against the splitting of Latvian lands and annexation of Kurzeme by Germany. On November 11, 1918 British Empire recognized Latvian National Council as de facto government, confirming a prior verbal communication of October 23 to Zigfrīds Anna Meierovics by the British Minister for Foreign Affairs, A. J. Balfour. Despite these successes, National Council had a major problem, the Social Democrats and the Democratic Bloc refused to join it. This prevented creation of a truly national consensus for proclaiming Independence. 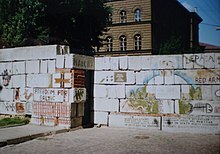 This was overcome only on November 17, 1918, when the People's Council (Tautas padome) was created. On September 22, 1918 German Emperor Wilhelm II proclaimed Baltic provinces to be free and on November 5 Germans proclaimed United Baltic Duchy headed by the Duke Adolf Friedrich of Mecklenburg, however, this project (just like the similar Kingdom of Lithuania) collapsed together with the German Empire on November 9 and the Armistice of November 11. On November 26, 1918 the new General Plenipotentiary of Germany August Winnig recognized the Latvian Provisional Government which was established by the People's Council. On November 28 the Regency Council of the United Baltic Duchy disbanded itself. After the German collapse on November 9, the National Council and Democratic bloc began unity talks. Social Democrats insisted that the new Latvia should be a socialistic state, which was not acceptable to other parties. They also refused to join the National Council, instead insisting on creating a new unity organization. The unity talks were led by Farmers' Union leaders Kārlis Ulmanis and Miķelis Valters, while National Council leaders Voldemārs Zāmuēls, Arveds Bergs and Ādolfs Klīve were sidelined. On November 17, 1918 competing Latvian factions finally united in the Latvia’s Peoples Council (Tautas padome), which on November 18, 1918 proclaimed the Independence of Republic of Latvia and created the Latvian Provisional Government. A few days later Soviet Russia started westward offensive aimed at regaining its western provinces and the War of Independence began. The left wing of Latvian Social Democrats had become allied with Bolsheviks and during its conference of November 18–19, 1918 proclaimed that Latvian commune is a part of Russian Soviet Federation. On December 1, 1918 Soviet Russia invaded Latvia. Much of the invading army in Latvia consisted of Red Latvian Riflemen, which made the invasion easier. Soviet offensive met little resistance coming just a few weeks after the collapse of German Empire and proclamation of independent Latvia. Social Democratic party at this point decided to leave People's Council and rejoined it only in April 1918. On December 17, 1918 the Provisional government of Workers and Peasants, led by the veteran left-wing politician Pēteris Stučka proclaimed the Soviet rule. On December 18 Lenin officially recognized the new Soviet Latvia. Riga was captured by the Soviet Army on January 3, 1919. By the end of January Provisional Government and remaining German units had retreated all the way to Liepāja, but then the Red offensive stalled along the Venta river. The Latvian Socialist Soviet Republic was officially proclaimed on January 13 with the political, economic, and military backing of the Soviet Russia. Stučka established a radical communist regime of nationalizations, expropriations and executions of class enemies. Revolutionary tribunals were established, condemning to death German nobles, pastors, wealthy traders as well as peasants, who refused to surrender their grain, in total some 1000 people were executed. Due to food supply disruptions 8590 people starved to death in Riga. On March 3, 1919 German and Latvian forces commenced a counterattack against the forces of Soviet Latvia. On April 16 the Baltic nobility organized a coup d'état in Liepāja and the puppet government under the leadership of Andrievs Niedra was established. The provisional national government took the refuge aboard steamship Saratov under British protection in Liepaja harbour. On May 22, 1919 Riga was recaptured by Freikorps and White Terror against any suspected Soviet sympathizers began. The same time Estonian Army including the North Latvian Brigade loyal to Ulmanis government starts a major offensive against the Soviets in north Latvia. By the middle of June Soviet rule was reduced to Latgale. In June 1919 collisions started between the Baltische Landeswehr on one side and the Estonian 3rd division, including the 2nd Cēsis regiment of North Latvian brigade on the other. The 3rd division defeated the German forces in the Battle of Wenden on June 23. An armistice was signed at Strazdumuiža, under the terms of which the Germans had to leave Latvia. Instead the German forces were incorporated into the West Russian Volunteer Army. On October 5 it commenced an offensive on Riga taking the west bank of the Daugava River with front line splitting Riga in half. On November 11 the Latvian counteroffensive began and by the end of the month they were driven from Latvia. During battles in Riga, Latvian forces were supported by British naval artillery. On January 3, 1920 the united Latvian and Polish forces launched an attack on the Soviet army in Latgale and after the Battle of Daugavpils liberated Daugavpils. By the end of January they reached the ethnographic border of Latvia and peace negotiations with Soviets soon began. During the 1919 Paris Peace conference Latvia had unsuccessfully lobbied for international de jure recognition of its independence by the Allied countries. Allies still hoped for a quick end of the Bolshevik regime and establishment of a democratic Russian state which will grant Latvia large degree of autonomy. The internal situation also was unstable, as during 1919 three different governments (Latvians, Germans-White Russians, Soviets) were fighting for the control. According to Latvian diplomats, during that time the US and France were against recognizing Latvia, Italy and Japan supported it while the United Kingdom gave limited support and waited for the events to play out. On August 11, 1920 according to the Latvian–Soviet Peace Treaty the Soviet Russia relinquished authority over the Latvian nation and claims to Latvian territory as "Russia recognizes without objection the independence and sovereignty of the Latvian State and forever renounces all sovereign rights held by Russia in relation to the Latvian nation and land on the basis of the previous State legal regime as well as any international agreements, all of which lose their force and effect for all future time as herein provided. The Latvian nation and land shall have no obligations arising from their previous possession by Russia." In 1920 Latvia, together with Lithuania and Estonia, tried to join the League of Nations but was denied the membership. As the Soviet victory in the Russian Civil War became clear and after heavy lobbying by the Foreign Minister Zigfrīds Anna Meierovics, the Allied Supreme War Council, which included United Kingdom, France, Belgium, Italy and Japan, recognized Latvia's independence on January 26, 1921. Recognition from many other countries followed soon. Latvia also became a member of the League of Nations on September 22, 1921. The US recognized Latvia only in July 1922. Before 1940 Latvia was recognized by 42 countries. After Latgale was finally liberated from the Soviets in January 1920, on April 17–18, 1920 elections to the Constitutional Assembly of Latvia were held. While the population of Latvia had fallen by almost a million, from 2,552,000 to 1,596,000 in 1920 (in Riga from 520,000 to 225,000), they were represented by 50 lists of parties and candidates that competed for 150 seats. Close to 85% eligible voters participated in elections and 16 parties were elected. Social Democratic Workers' Party won 57, Farmers' Union 26, Latgalian Peasant Party won 17 seats. This voting pattern marked all the future parliaments – high number of parties representing small interest groups required formation of unstable coalition governments, while the largest single party, Social Democrats, held the post of Speaker of the Saeima, they avoided participating in governments. Between 1922 and 1934 Latvia had 13 governments led by 9 Prime Ministers. On February 15, 1922 the Constitution of Latvia and in June the new Law on Elections were passed, opening the way to electing the parliament – Saeima. During the Parliamentary era, four elections were held which elected 1st Saeima (1922–25), 2nd Saeima (1925–28), 3rd Saeima (1928–31), 4th Saeima (1931–34). Three State Presidents were elected – Jānis Čakste (1922–27) who died in office, Gustavs Zemgals (1927–30) who refused to be re-elected and Alberts Kviesis (1930–36) who accepted the May 15 coup d'état. The Latvian-Soviet peace treaty had set the eastern border between Latvia and Soviet Russia. After 1944 parts of Abrene District were annexed by Russia as Pytalovsky District. Latvia gave up all legal claims to these lands in 2007. During 1919 Estonia had provided military assistance to Latvia on a condition that some of its territorial claims in Vidzeme will be met. This was refused by Latvians and Estonia withdrew its support. Estonian claims centered on Valka district as well as territories in Ape, Veclaicene, Ipiķi and Lode. On March 22, 1920 Estonia and Latvia agreed to a settlement commission led by British colonel Stephen Tallents. Latvia retained Ainaži parish, and most of other contested lands, but lost most of Valka city (now Valga, Estonia). Issue of the ethnic Swedish inhabited Ruhnu island in the Gulf of Riga was left for both countries to decide. Latvia finally renounced all claims on Ruhnu island after signing military alliance with Estonia on November 1, 1923. Latvia proposed to retain the southern border or former Courland governorate with Lithuania unchanged, but Lithuanians wanted to gain access to the sea, as at this time they did not control German lands of Klaipėda. In September 1919, during attack against the Soviets, Lithuanian army occupied much of Ilūkste Municipality and threatened to take Daugavpils as well. Between late August and early September 1920 Latvian army pushed Lithuanians out. Lithuanians were weakened by Żeligowski's Mutiny and did not escalate this confrontation. On September 25, 1920 Latvia and Lithuania agreed to seek international arbitration committee led by James Young Simpson to settle this dispute. On March 1921, Lithuania was given port town Palanga, village of Šventoji, parts of Rucava Municipality and railroad junction of Mažeikiai on Rīga – Jelgava – Liepāja railroad line, which meant that Latvia had to build a new railway line. Latvia received town of Aknīste and some smaller territories in Aknīste Municipality, Ukri parish and Bauska Municipality. Latvia gave up 283,3 square km, while receiving 290 km2. About 16–20 000 ethnic Latvians thus became Lithuanian citizens. As a result of Polish–Soviet War, Poland secured a 105 km long border with Latvia. In July 1919 Poland announced annexation of all lands south of Daugavpils and their inclusion in Braslaw district. Latvia could not complain, as it still needed Polish military help for the decisive Battle of Daugavpils against the Soviets. The issue was solved by renewed Soviet attack against Poland, and later, by Polish-Lithuanian conflict over Vilnius. During the Soviet attack in July 1920, Polish forces retreated from this area which then was occupied by Latvian forces. After Żeligowski's Mutiny Poland wanted to have good diplomatic relations with Latvia and did not raise any serious territorial claims. The issue was solved in February 1929, when Latvian-Polish trade treaty was signed, which included a secret agreement about compensations to Polish landowners over lost properties. By 1937 Latvia had paid the full amount of 5 million golden lats. Over some protests from Lithuania, Latvian-Polish border was demarcated between 1933 and 1938. The earliest foreign policy goals were securing peace with Soviet Russia and Germany, gaining international recognition and joining the League of Nations. All this was achieved by the efforts of Zigfrīds Anna Meierovics. The hope of union of Baltic countries – Poland, Lithuania, Latvia, Estonia, Finland – faded after 1922. After that Latvia was the most energetic proponent of Baltic unity and Baltic Entente. On November 1, 1923 Latvia and Estonia signed a military alliance, followed by trade agreements. Latvia tried to maintain good relations with regional hegemons Russia and Germany and hoped for more support from the Great Britain. 21 foreign embassies and 45 consulates were opened in Latvia by 1928, some of these consulates were located in port cities Liepāja and Ventspils. Latvia purchased embassy buildings in Berlin (1922), Tallinn, Warsaw (1923), London (1925), Paris (1927), Geneva (1938). Social Democratic Workers' Party, as the largest party, held the position of the Speaker of the Saeima in all the interwar Saeimas. 1st Saeima was chaired by Frīdrihs Veismanis, Second, Third and Fourth Saeimas were chaired by Pauls Kalniņš. The refusal of Social Democrats to participate in governments (except twice in short-lived cabinets) meant that government was usually led by the center-right Farmers' Union, or a coalition of smaller parties, as Saeima was split among many parties with just a few MPs. Social Democrats were split between the main Social Democratic Workers' Party led by Pauls Kalniņš, Ansis Rudevics and Fricis Menders (which first won 30 seats but had a tendency to lose votes in subsequent elections) and the splinter Social Democrat Minority Party, led by Marģers Skujenieks, who were more centrist and managed even to lead governments on two occasions. The mainstream Social Democrat party maintained strong policy of Socialist International ideals, criticized the existing capitalist system, avoided using State flag and singing National anthem, instead using the Red flag and singing the Internationale in their meetings. Their popularity increasingly fell and in the 4th Saeima they had only 21 seats. The officially banned Communist Party of Latvia in 1928 elections managed to get 5 seats as the Left Trade Union which was banned in 1930. In 1931 elections Communists won 6 seats as the Trade Union Workers and Peasants Group, but were once again banned in 1933. Latvian Farmers' Union was the second largest parliamentary faction with 14–17 MPs and the largest of the conservative parties. It increasingly had to compete with some smaller farmer, catholic farmer and Latgale farmer parties which won more votes in each elections. Farmer's Union was led by Kārlis Ulmanis, Zigfrīds Anna Meierovics and Hugo Celmiņš. The decreasing popularity of Ulmanis and Farmers' Union might have been one of the reasons behind the May 15, 1934 Latvian coup d'état, as Ulmanis tried to prevent further loss of his political influence and power after the elections, scheduled for October 1934. Democratic Centre Party, led by Gustavs Zemgals represented mostly urban, middle-class office workers and state employees. National Union, led by Arveds Bergs was nationalistic, anti-Soviet, center-right party that attracted urban followers. The extreme nationalists were represented by anti-semitic Pērkonkrusts, led by Gustavs Celmiņš. Most of the remaining small parties were either ethnic – German, Jewish, Polish or represented single-issue economic groups – small-holders, house owners, even railroad workers. The small parties usually formed larger coalitions (blocks) and then used their influence to join governing coalition. One of the most influential was coalition of Latgale parties. During this time four referendums took place, all indicative of the issues facing the new state. On July 19, 1922 a Concordat was signed with Vatican. This was motivated by the need to better integrate heavily Catholic Latgale in the Lutheran dominated state. In traditionally Lutheran Riga some buildings belonging to Russian Orthodox Church were given to Catholics and the Lutheran St. James's Cathedral was transferred to Catholics as their new cathedral. On September 1–2, 1923 the Church property referendum was held in order to prevent any further forcible transfer of churches and properties from one confession to another. About 200,000 or 20% of voters participated, and it failed. On June 2, 1927 Saeima once again changed the Citizenship law. In earlier version Latvian citizenship was granted to anyone who had lived in Latvia for 20 years before the August 1, 1914 (start of the WWI). Now this was shortened to 6 months before the August 1, 1914. This was mainly done to allow many Latvian farming colonists, who now were fleeing Soviet Russia, to receive citizenship. However, this also meant that many Soviet Jews now could claim Latvian citizenship. On December 17–18, 1927 the Latvian citizenship referendum was held to prevent these new changes, but it failed, as only 250,000 or 20% of voters participated. The Concordate with Vatican caused another church property referendum in 1931. After the St. Jame's Cathedral was given to Catholics, Latvian Lutherans had lost their bishop's cathedral and were sharing the Riga Cathedral with Baltic German congregation, which belonged to the autonomous German Lutheran confession. The anti-German sentiment was widespread and initiative to give Riga Cathedral to Latvian Lutherans gained strength. On September 5–6, 1931 almost 400,000 voters supported this idea, but referendum failed, as it did not gather over 50% of votes. In any case, Saeima soon passed a law confiscating the church from Germans and giving it to Latvians. On February 24–25, 1934 the Insurance Law referendum was held in order to introduce a new old and unemployment benefit scheme which would be funded by taxing employers, higher wage earners and municipalities. The referendum was initiated by Social Democrats, who managed to get over 400,000 votes for this idea, but referendum failed. The new state had to deal with two main issues: restoration of industrial plants, especially in Riga and implementation of Land reform that would transfer most of the land from German nobles to Latvian farmers. Constituent Assembly passed the law of the Land reform, which expropriated the manor lands. Landowners were left with 50 hectares each and their land was distributed to the landless peasants without cost. In 1897, 61.2% of the rural population had been landless; by 1936, that percentage had been reduced to 18%. The extent of cultivated land surpassed the pre-war level already in 1923. Before the World War I some 2% of landowners owned 53% of land in Kurzeme and Vidzeme, in Latgale it was 38%. The Agrarian reform Law of September 16, 1920 created State Land Fund which took over 61% of all land. The German nobles were left with no more than 50 ha of land. This destroyed their manor house system. Many of them sold their possessions and left for Germany. Former manor house buildings often were used as local schools, administrative buildings or hospitals. The land was distributed to a new class of small-holding farmers – over 54,000 Jaunsaimnieki (New farmers) with average farm size of 17,1 ha, who usually had to create their farms from nothing, in process building new houses and clearing fields. Due to their small size and unfavorable grain prices, the new farmers rapidly developed dairy farming. Butter, bacon and eggs became new export industries. Flax and state owned forests were another export revenue source. On March 27, 1919 the Latvian rublis was introduced with an exchange rate of 1 Latvian rublis equal to 1 ostruble, 2 German marks and 1,5 czar rubles. On March 18, 1920 Latvian rublis was made the only legal currency. Due to high inflation, the new Latvian lats currency was introduced at a rate 1 lat to 50 rublis. In 1923 the Bank of Latvia was established and lats replaced rublis in 1925. Between 1923 and 1930 state budget was with a surplus. On average 25,5% went to defense, 11,2% to education and 23,4% to capital investment projects. Around 15% of income was generated by state spirits monopoly. The restoration of industry was more complicated. Before World War I 80% of industrial production was made for internal Russian Empire markets. Trade agreement with Soviet Union was signed in 1927 but did not result in high trade volumes. By the end of 1920s Latvia's largest export markets were Germany (35,6%), United Kingdom (20,8%), France, Belgium, Netherlands (22,9%). Latvia had to import almost all of modern machinery and fuels. In 1929 Latvia had 3 state owned banks, 19 private banks, 605 credit unions and many more mutual credit unions. The Great Depression reached Latvia in the middle of 1930. Exports fell and imports were strictly limited, to save foreign exchange reserves. State monopolies of sugar and bacon were created. To prevent banks from collapse, between July 31, 1931 and September 1, 1933 a law was in force which prohibited withdrawal of more than 5% of the total deposit per week. In 1932 the trade agreement with Soviet Union expired and industrial unemployment reached its peak in January 1932. The national income fell from 600 lats per capita in 1930 to 390 lats per capita in 1932. In place of free international trade came interstate clearing agreements which set the volumes and types of goods that states then would trade. In 1932 clearing agreements were signed with France and Germany, in 1934 with the United Kingdom, in 1935 with Sweden, Estonia and Lithuania. Economic recovery started in 1933 as production increased by some 30%. The state budget deficit was reduced from the record 24,2 million lats in 1931/32 to 7,8 million lats in 1933/34 budget. On the night from May 15 to 16, 1934 the Prime Minister Kārlis Ulmanis and Minister of War Jānis Balodis, fathers of Latvian independence, took power by a bloodless coup d'état. Parliament and Constitution were suspended, State of War introduced, all political parties banned and press censorship established. Just as in the politics, in economy the new Ulmanis regime was very active in increasing state control and planning mechanisms. In 1934 regime created Chamber of Trade and Industry was established, followed by the Chamber of Agriculture and the Chamber of Artisans in 1935 and the Chamber of Labour in 1936. The state helped bankrupt farmers by postponing bankruptcy auctions and refinanced their debt at a lower rate. On May 29, 1934 state took control over cooperative societies and associations. Dairy industry was placed under control of Central Union of Dairy Farmers. On April 9, 1935 a state controlled Credit Bank of Latvia was created which reduced role of foreign capital by creating many state owned industry monopolies and joint stock companies. Buyouts and liquidations of foreign, Baltic German and Jewish owned companies become a norm. In place of many competing companies large state owned companies were created. In 1939 state owned 38 such companies. The new JSC Vairogs produced railway carriages and Ford-Vairogs automobiles under Ford licence. VEF made world's smallest Minox cameras and such experimental aircraft as VEF JDA-10M, VEF I-12 and others. Between 1936 and 1939 the Ķegums Hydroelectric Power Station, with 70,000 kWh capacity largest in the Baltics, was built by Swedish companies. After Western countries abandoned the gold standard, the Latvian lats was pegged to the British pound in September 1936. It was a devaluation that further strengthened Latvian exports. By 1939, following an export boom propelled primarily by agricultural goods, Latvia was the richest of the Baltic countries, and had a GDP per capita higher than Finland or Austria. However, the recovery from the Great Depression took almost ten years. National income was 444 lats per capita in 1933 and reached 637 lats per capita in 1938, thus finally overtaking the 1929 levels. After the start of World War II Latvia declared complete neutrality, but it was now completely cut off from the market of United Kingdom, as Germany had sealed off the Baltic sea. Austerity was introduced on September 3, 1939. The politically disastrous October 5, 1939 Soviet–Latvian Mutual Assistance Treaty provided new export and import opportunities. On October 18, 1939 a new trade agreement was signed with the Soviet Union. Latvia exported its food products in return receiving oil, fuel and chemicals. On December 15, 1939 a new trade agreement was also signed with the Nazi Germany. Latvian farmers had traditionally relied on seasonal farm workers from Poland, this was now cut-off by the war, and in spring 1940 new regulations introduced compulsory work service for state employees, students and school pupils. In October 1936 Latvia was elected as non-permanent member of the Council of the League of Nations and retained this place for three years. In 1935 embassy in Washington was re-opened, which later served as important center for Latvian Diplomatic Service during 50 years of Soviet occupation. After the Munich Agreement demonstrated the failure of collective security system, Latvia on December 13, 1938 proclaimed absolute neutrality. On March 28, 1939 Soviet Union without any discussions announced that it is interested in maintaining and defending Latvia's independence. On June 7, 1939 Latvia and Germany signed non-aggression treaty. The Soviet Union guaranteed its interests in the Baltics with the signing of the Molotov–Ribbentrop Pact between the Soviet Union and Nazi Germany on August 23, 1939. Under threat of invasion,[note 1] Latvia (along with Estonia and Lithuania) signed the Soviet–Latvian Mutual Assistance Treaty with Soviet Union, providing for the stationing of up to 25,000 Soviet troops on Latvian soil. Following the initiative from Nazi Germany, Latvia on October 30, 1939 concluded an agreement to "repatriate" ethnic Germans, most of whom had lived in the region for generations, in the wake of the impending Soviet takeover. Seven months later, the Soviet foreign minister Vyacheslav Molotov accused the Baltic states of conspiracy against the Soviet Union. On June 16, 1940, threatening an invasion,[note 2] Soviet Union issued an ultimatum demanding that the government be replaced and that an unlimited number of Soviet troops be admitted. Knowing that the Red Army had entered Lithuania a day before, that its troops were massed along the eastern border and mindful of the Soviet military bases in Western Latvia, the government acceded to the demands, and Soviet troops occupied the country on June 17. Staged elections were held July 14–15, 1940, and the results were announced in Moscow 12 hours before the polls closed; Soviet documents show the election results were forged. The newly elected "People's Assembly" declared Latvia a Socialist Soviet Republic and applied for admission into the Soviet Union on July 21. Latvia was incorporated into the Soviet Union on August 5, 1940. Latvian diplomatic service continued to function in exile while the republic was under the Soviet control. In the spring of 1941, the Soviet central government began planning the mass deportation of anti-Soviet elements from the occupied Baltic states. In preparation, General Ivan Serov, Deputy People's Commissar of Public Security of the Soviet Union, signed the Serov Instructions, "Regarding the Procedure for Carrying out the Deportation of Anti-Soviet Elements from Lithuania, Latvia, and Estonia." During the night of June 13–14, 1941, 15,424 inhabitants of Latvia — including 1,771 Jews and 742 ethnic Russians — were deported to camps and special settlements, mostly in Siberia. 35,000 people were deported in the first year of Soviet occupation (131,500 across the Baltics). The Nazi invasion, launched a week later, cut short immediate plans to deport several hundred thousand more from the Baltics. Nazi troops occupied Riga on July 1, 1941. Immediately after the installation of German authority, a process of eliminating the Jewish and Gypsy population began, with many killings taking place in Rumbula. The killings were committed by the Einsatzgruppe A, the Wehrmacht and Marines (in Liepāja), as well as by Latvian collaborators, including the 500–1500 members of the infamous Arajs Commando (which alone killed around 26,000 Jews) and the 2000 or more Latvian members of the SD. By the end of 1941 almost the entire Jewish population was killed or placed in the concentration camps. In addition, some 25,000 Jews were brought from Germany, Austria and the present-day Czech Republic, of whom around 20,000 were killed. The Holocaust claimed approximately 85,000 lives in Latvia, the vast majority of whom were Jews. A large number of Latvians resisted the German occupation. The resistance movement was divided between the pro-independence units under the Latvian Central Council and the pro-Soviet units under the Latvian Partisan Movement Headquarters (Латвийский штаб партизанского движения) in Moscow. Their Latvian commander was Arturs Sproģis. The Nazis planned to Germanise the Baltics after the war. In 1943 and 1944 two divisions of Waffen-SS were formed from Latvian conscripts and volunteers to help Germany against the Red Army. In 1944, when the Soviet military advances reached the area heavy fighting took place in Latvia between German and Soviet troops, which ended with another German defeat. Riga was re-captured by the Soviet Red Army on October 13, 1944 while the Courland Pocket held out until May 9, 1945. During the course of the war, both occupying forces conscripted Latvians into their armies, in this way increasing the loss of the nation's "live resources". In 1944, part of the Latvian territory once more came under Soviet control and Latvian national partisans began their fight against another occupier – the Soviet Union. 160,000 Latvian inhabitants took refuge from the Soviet army by fleeing to Germany and Sweden. On the other side, many Latvians who had previously supported Bolshevism had chosen to remain in Soviet Russia, where they wielded disproportionate influence in the party. Latvian theatres, Latvian publishing houses, Latvian clubs, were all present in Soviet Russia, a whole culture all wiped out from 1937 onwards when, accused of fascist, nationalist or counter-revolutionary sympathies, Latvians were purged in their thousands. The first post-war years were marked by particularly dismal and sombre events in the fate of the Latvian nation. On March 25, 1949, 43,000 rural residents ("kulaks") and Latvian patriots ("nationalists") were deported to Siberia in a sweeping repressive Operation Priboi in all three Baltic States, which was carefully planned and approved in Moscow already on January 29, 1949. Altogether 120,000 Latvian inhabitants were imprisoned or deported to Soviet concentration camps (the Gulag). Some managed to escape arrest and joined the partisans. Flag of the Latvian SSR. In the post-war period, Latvia was forced to adopt Soviet farming methods and the economic infrastructure developed in the 1920s and 1930s was eradicated. Rural areas were forced into collectivisation. The massive influx of labourers, administrators, military personnel and their dependents from Russia and other Soviet republics started. By 1959 about 400,000 persons arrived from other Soviet republics and the ethnic Latvian population had fallen to 62%. An extensive programme to impose bilingualism was initiated in Latvia, limiting the use of Latvian language in favor of Russian. All of the minority schools (Jewish, Polish, Belarusian, Estonian, Lithuanian) were closed down leaving only two languages of instructions in the schools- Latvian and Russian. The Russian language were taught notably, as well as Russian literature, music and history of Soviet Union (actually- history of Russia). On March 5, 1953 Joseph Stalin died and his successor became Nikita Khrushchev. The period known as the Khrushchev Thaw began but attempts by the national communists led by Eduards Berklavs to gain a degree of autonomy for the republic and protect the rapidly deteriorating position of the Latvian language were not successful. In 1959 after Krushchev's visit in Latvia national communists were stripped of their posts and Berklavs was deported to Russia. Because Latvia had still maintained a well-developed infrastructure and educated specialists it was decided in Moscow that some of the Soviet Union's most advanced manufacturing factories were to be based in Latvia. New industry was created in Latvia, including a major machinery factory RAF in Jelgava, electrotechnical factories in Riga, chemical factories in Daugavpils, Valmiera and Olaine, as well as food and oil processing plants. However, there were not enough people to operate the newly built factories. In order to expand industrial production, more immigrants from other Soviet republics were transferred into the country, noticeably decreasing the proportion of ethnic Latvians. By 1989, the ethnic Latvians comprised about 52% of the population (1,387,757), compared to a pre-war proportion of 77% (1,467,035). In 2005 there were 1,357,099 ethnic Latvians, showing a real decrease in the titular population. Proportionately, however, the titular nation already comprises approximately 60% of the total population of Latvia (2,375,000). Barricade in Riga to prevent the Soviet Army from reaching the Latvian Parliament, July 1991. Liberalization in the communist regime began in the mid-1980s in the USSR with the perestroika and glasnost instituted by Mikhail Gorbachev. In Latvia, several mass political organizations were constituted that made use of this opportunity – Popular Front of Latvia (Tautas Fronte), Latvian National Independence Movement (Latvijas Nacionālās Neatkarības Kustība) and Citizens' Congress (Pilsoņu kongress). These groups began to agitate for the restoration of national independence. On the 50th anniversary of the Molotov-Ribbentrop pact (August 23, 1989) to the fate of the Baltic nations, Latvians, Lithuanians and Estonians joined hands in a human chain, the Baltic Way, that stretched 600 kilometers from Tallinn, to Riga, to Vilnius. It symbolically represented the united wish of the Baltic States for independence. Subsequent steps toward full independence were taken on May 4, 1990. The Latvian SSR Supreme Council, elected in the first democratic elections since the 1930s, adopted a declaration restoring independence that included a transition period between autonomy within the Soviet Union and full independence. In January 1991, however, pro-communist political forces attempted to restore Soviet power with the use of force. Latvian demonstrators managed to stop the Soviet troops from re-occupying strategic positions (January 1991 events in Latvia). On August 21, after unsuccessful attempt at a coup d'état in Moscow, parliament voted for an end to the transition period, thus restoring Latvia's pre-war independence. On September 6, 1991 Latvian independence was once again recognized by the Soviet Union. George W. Bush, Vaira Vīķe-Freiberga, Arnold Rüütel, and Valdas Adamkus in Riga, May 7, 2005. Soon after reinstating independence, Latvia, which had been a member of the League of Nations prior to World War II, became a member of the United Nations. In 1992, Latvia became eligible for the International Monetary Fund and in 1994 took part in the NATO Partnership for Peace program in addition to signing the free trade agreement with the European Union. Latvia became a member of the European Council as well as a candidate for the membership in the European Union and NATO. Latvia was the first of the three Baltic nations to be accepted into the World Trade Organization. At the end of 1999 in Helsinki, the heads of the European Union governments invited Latvia to begin negotiations regarding accession to the European Union. In 2004, Latvia's most important foreign policy goals, membership of the European Union and NATO, were fulfilled. On April 2, Latvia became a member of NATO and on May 1, Latvia, along with the other two Baltic States, became a member of the European Union. Around 67% had voted in favor of EU membership in a September 2003 referendum with turnout at 72.5%. ^ Soviet-Latvian negotiations started on October 2, 1939 and on the following day Latvia's Minister of Foreign Affairs Vilhelms Munters informed his government that Josif Stalin had said that "as for the Germans, [there is no obstacle], we can occupy you" and threatened that the USSR could also seize "territory with a Russian minority." ^ and presenting the ultimatum and accusations of violation by Latvia of the terms of mutual assistance treaty of 1939, Molotov issued an overt threat to "take action" to secure compliance with the terms of ultimatum – see report of Latvian Chargé d'affaires, Fricis Kociņš, regarding the talks with soviet Foreign Commissar Molotov. ^ Ragsdale, Hugh; V. N. Ponomarev (1993). Imperial Russian foreign policy. Cambridge University Press. p. 42. ISBN 978-0-521-44229-9. ^ a b c d e f g h Will Mawhood. "What became of Latvia's left?". openDemocracy. Retrieved December 18, 2017. ^ Bleiere, Daina; Ilgvars Butulis; Antonijs Zunda; Aivars Stranga; Inesis Feldmanis (2006). History of Latvia : the 20th century. Riga: Jumava. p. 68. ISBN 9984-38-038-6. OCLC 70240317. ^ LtCol Andrew Parrott. "The Baltic States from 1914 to 1923: The First World War and the Wars of Independence" (PDF). Baltic Defence Review. 2/2002. Archived from the original (PDF) on March 19, 2009. ^ a b c Colonel Jaan Maide. Ülevaade Eesti Vabadussõjast (1918–1920) (Overview on Estonian War of Independence) (in Estonian). Archived from the original on August 22, 2010. ^ Ēriks Jēkabsons. Latvijas un Polijas robeža 1919.-1939. gadā. ^ "Latvijas valsts ārpolitika un diplomātiskais dienests". Archived from the original on June 1, 2016. Retrieved May 1, 2016. ^ Bleiere, Daina; Ilgvars Butulis; Antonijs Zunda; Aivars Stranga; Inesis Feldmanis (2006). History of Latvia : the 20th century. Riga: Jumava. p. 195. ISBN 9984-38-038-6. OCLC 70240317. ^ Dr. hab.hist. Inesis Feldmanis (2004). "The Occupation of Latvia: Aspects of History and International Law". —. Ministry of Foreign Affairs of Latvia. Archived from the original on June 30, 2007. Retrieved February 21, 2007. ^ Elmārs Pelkaus, ed. (2001). Aizvestie: 1941. gada 14. jūnijā (in Latvian, English, and Russian). Riga: Latvijas Valsts arhīvs; Nordik. ISBN 9984-675-55-6. OCLC 52264782. ^ Bleiere, Daina; Ilgvars Butulis; Antonijs Zunda; Aivars Stranga; Inesis Feldmanis (2006). History of Latvia : the 20th century. Riga: Jumava. p. 418. ISBN 9984-38-038-6. OCLC 70240317. ^ Bleiere, Daina; Ilgvars Butulis; Antonijs Zunda; Aivars Stranga; Inesis Feldmanis (2006). History of Latvia : the 20th century. Riga: Jumava. p. 411. ISBN 9984-38-038-6. OCLC 70240317. ^ Bleiere, Daina; Ilgvars Butulis; Antonijs Zunda; Aivars Stranga; Inesis Feldmanis (2006). History of Latvia : the 20th century. Riga: Jumava. p. 379. ISBN 9984-38-038-6. OCLC 70240317. Bilmanis, Alfreds. A History of Latvia (1970). Eglitis, Daina Stukuls. Imagining the Nation: History, Modernity, and Revolution in Latvia (Post-Communist Cultural Studies) (2005). Lumans; Valdis O. Latvia in World War II (Fordham University Press, 2006) online edition. O'Connor, Kevin. "The History of the Baltic States," 2nd ed. (Santa Barbara, CA: ABC-CLIO, 2015). Palmer, Alan. The Baltic: A new history of the region and its people New York: Overlook Press, 2006; published In London with the title Northern shores: a history of the Baltic Sea and its peoples (John Murray, 2006). Plakans, Andrejs. Historical Dictionary of Latvia (2008). Plakans, Andrejs. The Latvians: A Short History (1995). The Baltic Germans are ethnic German inhabitants of the eastern shores of the Baltic Sea, in what today are Estonia and Latvia. Since their expulsion from Estonia and Latvia and resettlement during the upheavals and aftermath of the Second World War, Baltic Germans have markedly declined as a geographically determined ethnic group. The largest groups of present-day descendants of the Baltic Germans are found in Germany and Canada. It is estimated that several thousand still reside in Latvia and Estonia. 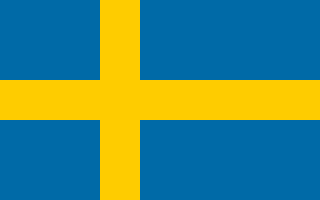 Swedish Livonia was a dominion of the Swedish Empire from 1629 until 1721. The territory, which constituted the southern part of modern Estonia and the northern part of modern Latvia, represented the conquest of the major part of the Polish-Lithuanian Duchy of Livonia during the 1600–1629 Polish-Swedish War. Parts of Livonia and the city of Riga were under Swedish control as early as 1621 and the situation was formalized in Truce of Altmark 1629, but the whole territory was not ceded formally until the Treaty of Oliva in 1660. The minority part of the Wenden Voivodeship retained by the Polish–Lithuanian Commonwealth was renamed the Inflanty Voivodeship, which today corresponds to the Latgale region of Latvia. The United Baltic Duchy, also known as the Grand Duchy of Livonia, was a state proposed by the Baltic German nobility and exiled Russian nobility after the Russian Revolution and German occupation of the Courland, Livonian, and Estonian governorates of the Russian Empire. It was proposed in April 1918, after Estonia and Latvia had formally declared independence. Latgale is one of the four historical and cultural regions of Latvia recognised in the Constitution of the Republic of Latvia. It is the easternmost region north of the Daugava River. While most of Latvia is historically Lutheran, Latgale is predominantly Roman Catholic, in fact, according to a 2011 survey, 65.8% of the total population is Catholic. There is also a strong Eastern Orthodox minority, comprising the 23.8%, divided in 13.8% Russian Orthodox Christians and 10.0% Old Believers. Cultural regions of Latvia are several areas within Latvia formally recognised as distinct from the rest of the country. While some of these regions are seen purely as culturally distinct, others have historically been parts of different countries and have been used to divide the country for administrative and other purposes. The Constitution of Latvia recognises four distinct regions: Kurzeme, Zemgale, Latgale and Vidzeme. Semigallia, also spelled Semigalia, is a historical region of Latvia, sometimes also including a part of Lithuania. It lies in the middle of the southern part of Latvia. Ainaži is a harbour town in the Vidzeme region of Latvia. The town is located near the Estonian border on the site of an ancient Liv fishing village. Before 1917, it was known by its German name Haynasch. The Curonians or Kurs were a Baltic tribe living on the shores of the Baltic Sea in what are now the western parts of Latvia and Lithuania from the 5th to the 16th centuries, when they merged with other Baltic tribes. They gave their name to the region of Courland (Kurzeme), and they spoke the Old Curonian language. Curonian lands were conquered by the Livonian Order in 1266 and they eventually merged with other Baltic tribes participating in the ethnogenesis of Lithuanians and Latvians. Direct descendants of the Curonians include the Kursenieki of the Curonian Spit and the so-called Curonian Kings of Courland. The House of the Livonian Noble Corporation is a historical building in Riga, Latvia, constructed to house the Landtag of the Livonian Noble Corporation in the Governorate of Livonia. Designed by architects Robert Pflug and Jānis Frīdrihs Baumanis, it was opened in 1867 and housed the Landtag until Latvian independence in 1919, and was subsequently damaged by fire in 1921. Today it is home to the Saeima, the parliament of Latvia. It is located in UNESCO listed Old Riga, directly opposite St. James's Cathedral.